By Chloe Grande and Tiffany Lam. 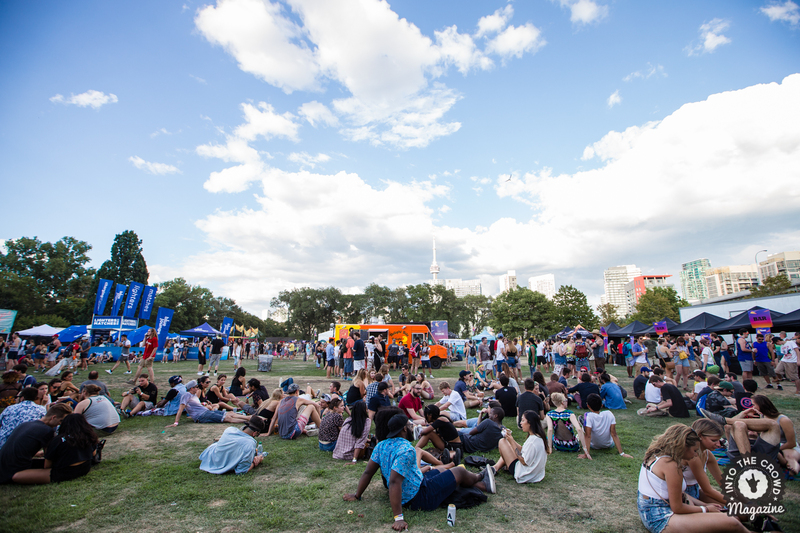 On August 6th, Embrace’s annual one-day summer festival TIME Festival returned to Toronto’s Fort York grounds for a scorching hot Saturday afternoon of electronic, hip hop and indie pop music. This year’s line-up featured a great diversity of artists including Joey Bada$$, Tokimonsta and Run the Jewels, as well as Kehlani, Broods and Bob Moses. For a smaller one-day music festival, the atmosphere was fun but laid-back, and gradually picked up as crowds poured in close together to see the headliners in the evening. While you couldn’t hear much going on from outside the Fork York grounds, attendance and energy was high. 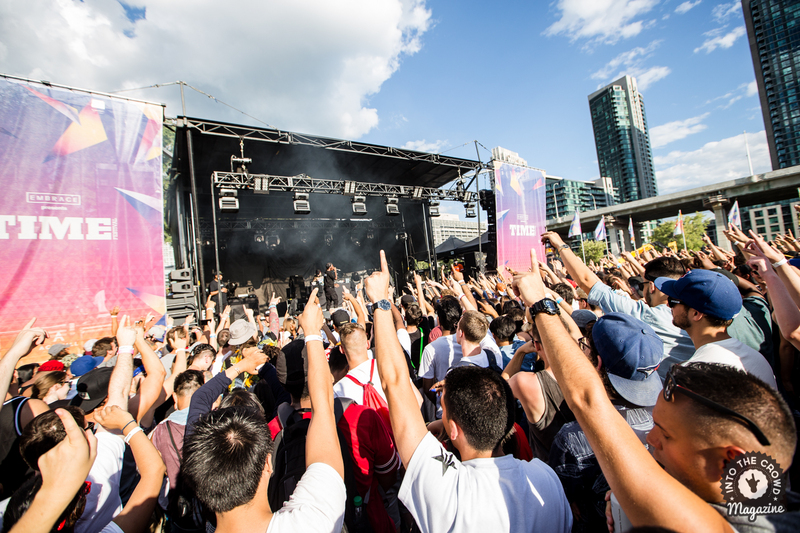 TIME Festival really proved itself to be a perfect one-day festival with a little bit of everything for everyone. Broods brought the indie pop electronica, Run The Jewels and Joey Bada$$ brought the crazy energetic hip hop rap shows, Kehlani brought the groovy R&B. 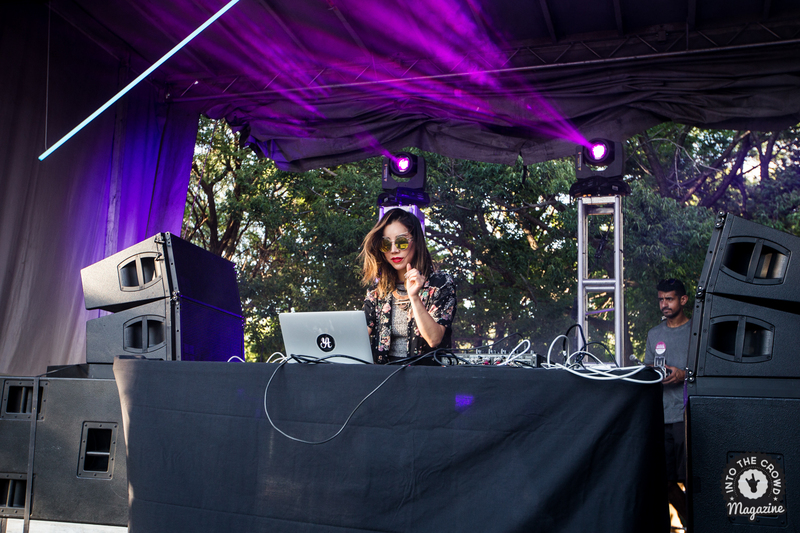 At the second stage, Tokimonsta gave TIME a taste of her hip hop electronica, and international artists KiNK and Jonas Rathsman pleased many with their house vibes. 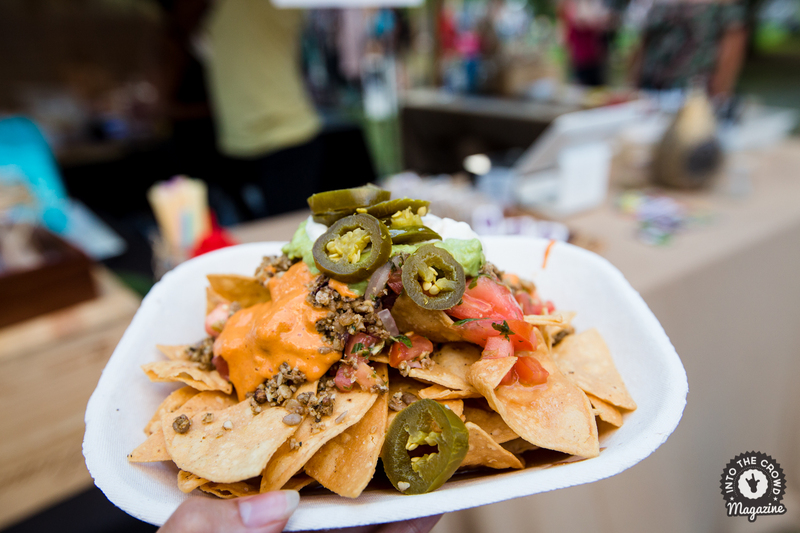 Aside from the music, the festival provided a decent variety of food vendors, from Haagen-Dazs ice cream sandwiches to vegan loaded nachos to bacon mac n’ cheese and more. Eight dollar drinks and free water stations kept everyone hydrated under the hot heat. There was also henna tattoo and body painting stations, as well as eclectic clothing and jewelry shops. A favourite of the day over at the Overtime Stage was Tokimonsta. The LA-based female producer had the audience hooked from start to finish, thanks to a well-crafted set. To warm up the crowd, Tokimonsta kicked off with mellow vibes that progressed gradually into heavier beats and some DnB. With her signature hip hop throw-ins (Kendrick Lamar, Missy Elliot, Busta Rhymes, etc. ), she transitioned her audience into her high-energy party with no one standing still. Over at the mainstage, notable favourites were Joey Bada$$ for a refreshing throwback to the upbeat ‘90s hip hop scene, as well as Broods, sister-brother indie pop duo from New Zealand, delivering a lively performance and heavenly vocals. 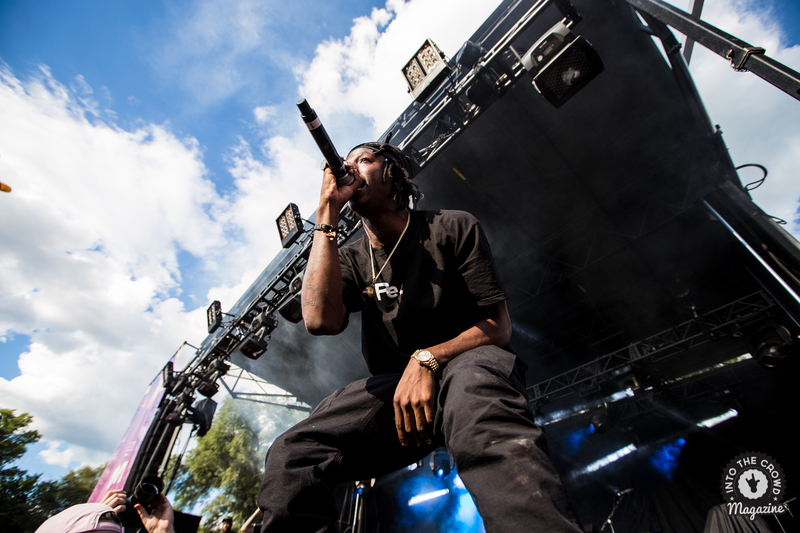 Joey Bada$$’s crowd was absolutely wild as fans raised their arms up without hesitation and chanted along to the twenty-year-old’s highly animated performance. 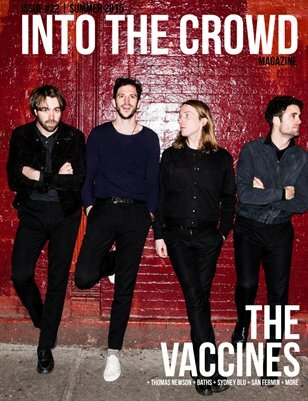 As for Broods, sweet-sounding vocals by Georgia, notably on popular hit “Bridges”, were definite crowd pleasers and a warm soother in preparation for the ruckus Run the Jewels was about to cause next. Twenty-one-year-old Kehlani also stole many hearts as she sang and danced up a storm on stage. Finally, hundreds of festival goers poured in to the mainstage for Run the Jewels. This was the most highly anticipated act of the festival, and needless to say, the politically-charged dynamic duo did not disappoint. Performing old and new, Run the Jewels gave TIME goers a mix of classic opening tracks like “Run the Jewels” and “Banana Clipper,” as well as later hits “Early” and “Lie, Cheat, Kill.” The jam-packed crowd was on fire, and Run the Jewels’ highly energetic performance was the reason for this. Without a doubt, these guys hold a special place in Toronto hip hop lovers’ hearts. If hip hop rap wasn’t your thing and indie or electronic was more up your alley, second stage headlining act Bob Moses’ was the one to catch after sun down. The live band offered a soothing, mesmerizing electronic performance that had the ability to touch the heart and soul. Cheesy, but completely true. Bob Moses live is organic and definitely something we will not forget. It wouldn’t be quite fair to compare TIME to the renown weekend-long music and arts festivals outside the city such as Wayhome or Osheaga, but for a day-long festival just around the corner, and at about 30$ a ticket, Toronto’s TIME festival is most definitely a great local alternative for those who can’t afford the weekend long festivals away. As August continues to fly by and summer nears its end, the beauty and popularity of music festivals is finally clear. It doesn’t matter if you don’t know the artists playing, nor if you’re not a heavy genre-specific music lover. With food vendors, activities and lounge areas across the grounds, the versatility of music festivals lets you explore and enjoy the day however you like, whether it be lounging under the grass with friends, chanting or dancing in a sea of people, or indulging on food truck goodies. Next time, grab some friends you want to spend the day with, because festivals like this one will give you a vibrant time you won’t forget. See you at TIME Festival 2017!